"How do you improve Florence Minor's terrific book (Katherine Tegen Bks., 2008) about the creatures that fascinate children? 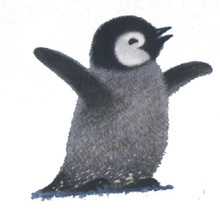 Add delightful music, playful penguin sounds, and a narrator with a subtle British accent. The CD opens with frolicsome penguin noises, immediately engaging listeners. Each double-page spread featuring Wendell Minor's beautiful, detailed art is introduced by fun, sparse and informative rhymes detailing the traits, habits, and talents of penguins. Listeners are invited to imagine all the things they could do-swim, toboggan, feed their chicks, and more-if they were penguins. Amusing fun facts about these creatures and the distinct calls of various species conclude the audiobook. Page-turn signals are optional. A welcome addition to collection's for young people, and an essential purchase for libraries that already circulate the book." "There’s no doubt that imagining flying underwater, singing duets, tobogganing, eating without dishes, and wearing fancy feathers will appeal to children. With this audio they will put themselves into a penguin’s feet and see how life takes on a whole new dimension. The Minors paint a detailed verbal and visual portrait of penguins and include fun facts as well. The production concludes with audio clips of penguin voices from the largest emperor to the smallest fairy. Antonia Bath is an unobtrusive narrator who lets the illustrations and her words carry the listener to another habitat. Her delivery is clear, her speed measured to provide moments for visualization and imagining. Gentle background music and sound effects provide atmosphere."